The fastest high-electron-mobility transistors reach nowadays an operation frequency in the terahertz regime (1012 Hz). A promising approach to extend the operation rate in future electronic devices to the petahertz regime (1015 Hz) is to control the physical properties in a semiconductor or dielectric material with intense optical laser pulses . To understand the physical limits to frequency scaling of high-speed electronics ultimately requires a fundamental understanding of the underlying attosecond (10-18 s) electron dynamics in a solid. How fast and at what rate can electrons be injected into the conduction band of a solid? In the last years, a number of publications demonstrated the possibility to resolve and control carrier dynamics in semiconductors [3,4] and dielectrics [5,6] using transient absorption spectroscopy. In this work, Schlaepfer et al. resolve for the first time the attosecond carrier dynamics in gallium arsenide pumped with an intense resonant near-infrared laser. Gallium arsenide is a technologically relevant narrow-band-gap semiconductor. During the light-matter interaction, the pump pulse can induce two types of transitions in the semiconductor. Electrons can be excited from the valence into the conduction band via the absorption of photons (so-called inter-band transition, Fig, 1(b)). In addition, the strong electric field of the pump can accelerate carriers efficiently within the individual bands (intra-band motion, Fig. 1(c)). The distinct role of the two mechanisms during the transient response is being highly debated. While only the former process produces electrons that can transport electrical current in an electronics component, Schlaepfer et al. found that the latter mechanism significantly enhances the number of these electrons. This finding is especially unexpected since intra-band motion itself cannot excite any electrons into the conduction band. The results of this work  represent an important step forward in understanding the scaling towards petahertz electron dynamics in semiconductors with attosecond time resolution, relevant for future ultrafast opto-electronic devices. Fig. 1. (a) Scheme of the experimental pump-probe setup. 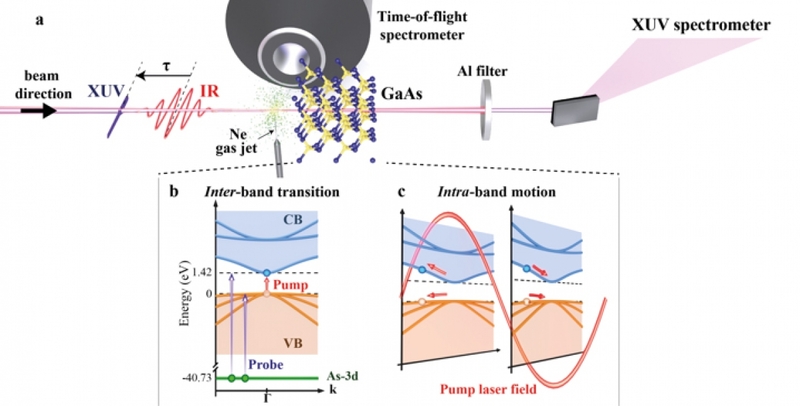 An intense few-cycle infrared (IR) laser pulse is combined with a single attosecond probe pulse with a spectrum in the extreme-ultraviolet (XUV) energy regime. The double target configuration consisting of a neon gas jet followed by a 100-nm thick freestanding GaAs membrane allows performing simultaneous streaking and absorption spectroscopy measurements. (b) & (c) Illustration of IR-induced inter- and intra-band transitions. The XUV pulse probes the modified carrier distribution around the bandgap via charge injection from the As-3d core level. Adapted from Schlaepfer et al., Nature Physics doi:10.1038/s41567-018-0069-0 (2018). F. Krausz, M. I. Stockman, “Attosecond metrology: from electron capture to future signal processing,” Nat. Photon. 8, 205-213 (2014). M. Schultze et al., “Attosecond band-gap dynamics in silicon,” Science 346, 1348-1352 (2014). H. Mashiko, K. Oguri, T. Yamaguchi, A. Suda, H. Gotoh, “Petahertz optical drive with wide-bandgap semiconductor,” Nat. Phys. 12, 741-745 (2016). M. Schultze et al., “Controlling dielectrics with the electric field of light,” Nature 493, 75-78 (2013). M. Lucchini et al., “Attosecond dynamical Franz-Keldysh effect in polycrystalline diamond,” Science 353, 916-919 (2016).